My previous month premium is postponed due to insufficient fund, but it has not been yet deducted although there has sufficient fund, so what can I do? pronati maity contact your bank. I am a private employee with one of the hospital,and they are already get EPF benefit. am I applicable for APY? s pramanik you are not eligible because you’re already getting pf benefit. For more you can contact customer care. Government employees cannot apply for atal pension yojana scheme. They are already getting pension benefit through provident fund. 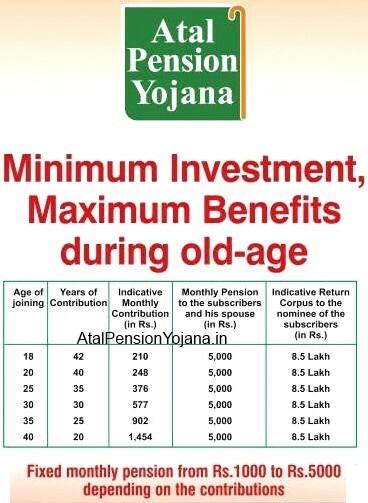 You are not allowed to apply for atal pension yojana scheme beacuse you are already getting benefit through PF. Hope this answers your query. I am kamal, Can my father subscribe the APY because his age is 59 years old. Please notify me. You father cannot apply for atal pension yojana because the age to apply for apy is between 18-40. I have joined APY and i am not a tax payer as well as not covered through any pension scheme. But, suppose in future a person gets a government job and then he joins NPS by his department and also a tax payer now.what will happen in that case? Also if a person gets married in future and he want to enroll spouse name as well as alter nominee details. Then how is it possible ? can I nominate my son/daughter as my wife/spause is default nominee. THANKS FOR YOUR REPLY, MY APY ACCOUNT GOT ACTIVATED FOUR DAYS BACK, NEITHER THE BANK HAS CHANGED THE NOMINEE NOR DEDUCTED ANY PREMIUM YET. EVEN HEAD OFFICE OF THE BANK HAS TOLD ME TO CONTACT LOCAL BRANCH ONLY. You are right, SPOUSE CAN NOT BE NOMINEE. And by default, she is the nominee. Try calling their head bank branch or on the customer care number of apy. Sir, After Registered APY, Then Which Type Of Paper I Will Recieved Any Bond Paper From Government For Pension. We are not sure, if you will receive any bond paper of Atal Pension Yojana from the government. Thanks for the prompt reply. In that case, what would be the maturity amount for my APY scheme and how does the monetary benefits vary from low-income segment folks? I am a private employee with one of the IT firms, am I applicable for APY? Atal Pension Yojana’s purpose is financial inclusion in India. Everyone is invited to be a part of apy. The main focus of Indian government is disadvantaged and low-income segments of society but if you are getting provident fund benefit from your IT firm, still you can join. The only difference is that you will not get any contribution from the government. govt servant is applicable of this scheme. Government servants can not apply for Atal Pension Yojana (apy) Scheme because they are already get PF benefit. how can I monitar my atal penson yojana account onlin. I have my APY PRAN no. in my sms but can’t trace my status on line. there is no way to monitor atal penson yojna online. Talk to your bank. Good news to here but 1 question we make the payment 18yrs after some circumtance we’ll not pay what the next procedure? Sreeshyla kumar kindly read here https://atalpensionyojana.in/penalty-charges/ to know more. You can not apply online. For atal pension yojna you will have to visit your bank branch, where you have bank account. There you will have to fill the form.